Travel back in the day used to be way more adventurous, thanks to disease in far-off lands, no Internet for planning, and Lao Che owning like, every single plane in China. 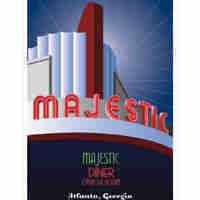 Taking you back, in poster form, Atlanta Vintage Travel. 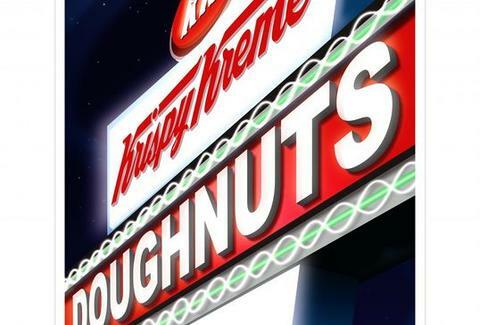 Atlanta: Localness includes a view of Tech Tower from ground level, parks like Lake Lanier, Poncey hangouts Krispy Kreme and Majestic Diner, plus tourist attractions like the GA Aquarium, The Varsity, and The Vortex (the famed burger joint, not the downtown connector). 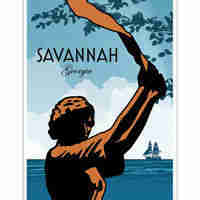 Savannah: The original state capital's represented via its Cockspur Island Lighthouse, the maroon lion that stands outside the Savannah Cotton Exchange, and "The Waving Girl", aka Florence Martus, who saluted every ship that passed her home on Elba Island for 44 years, unlike Florence MARTA, who salutes every bus that ignores her on Peachtree with a middle finger. 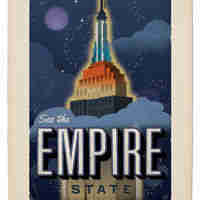 US Bureau of National Wonders: Get Georgia off your mind with stills of sights like Hawaii's Kilauea volcano and the Empire State Building, plus more generalized prints like "Air & Space" w/ vintage craft, and three versions (piano, singer, trumpet player) of "Where Jazz Was Born", which is certainly someplace not up to Uncle Phil's lofty standards. There're also vintage football prints of SEC schools, (hyping 1920s rivalry games between UGA & Florida, etc), plus prints with toddler-aged mascots of GA Tech, Florida State, Auburn, Clemson, and 'Bama that say "Start 'Em Young, Raise 'Em Right! ", a statement that also holds true for Shanghai getaway drivers.